Principal Michelle Seals collected autographs from the players to give to Noah, a student who was upset because he was too sick to attend school on the day the team came to visit. 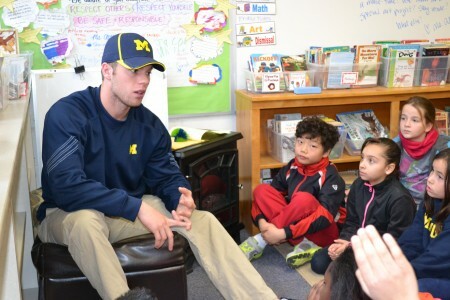 Ann Arbor native and Pioneer grad Travis Maezes talks about his hopes for a career in baseball. 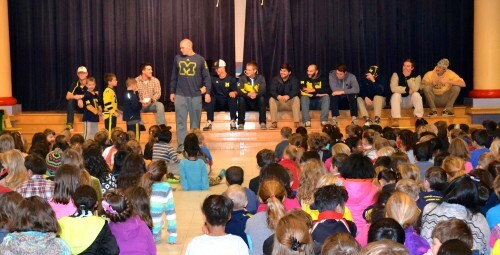 Eleven members of the University of Michigan varsity baseball team thrilled students at Lakewood Elementary Friday morning when they showed up during the school-wide community meeting. 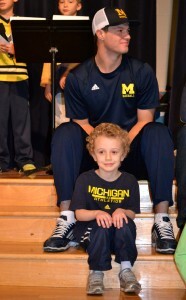 Junior Travis Maezes, a 2012 graduate of Pioneer High School with an impressive resume so far at U-M, was particularly popular with the students. “This was a lot of fun; we’re giving back to the community,” he said, while signing authographs for the kids. He recalled that when he was a student at Abbot and Dicken elementaries, high school athletes from the Pioneer Trailblazers program would come back to the schools to talk to the kids one-on-one. “I was wishing I could be an athlete like them, and eventually I ended up being one, so pretty cool,” Maezes said. 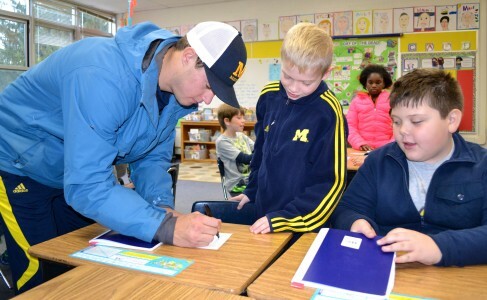 Right-handed pitcher Matt Ogden was impressed by the students’ enthusiasm. “I just had a great time being there,” he said. Principal Michelle Seals said it’s always great to have a partnership with neighbors. Assistant coach Aaron Etchison said the players like getting out into the community and hanging out with kids. 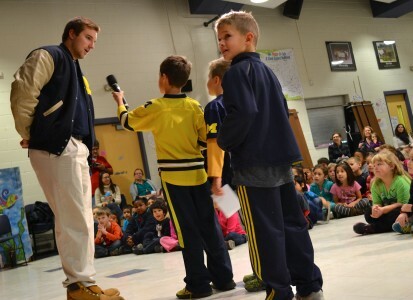 Lakewood students Jason Winterhalter, Owen Simmons and Ryan Anderson took turns asking questions of the athletes. 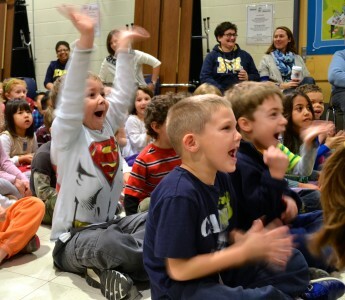 Here, Evan Hill recalls his favorite subject in grade school. 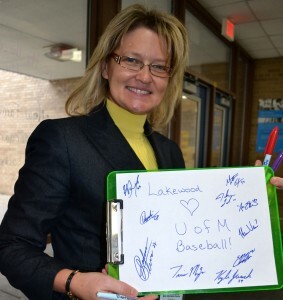 Baseball fan Michelle Seals thanks players Harrison Wenson, Matt Ogden and Kyle Jusick for coming to Lakewood. 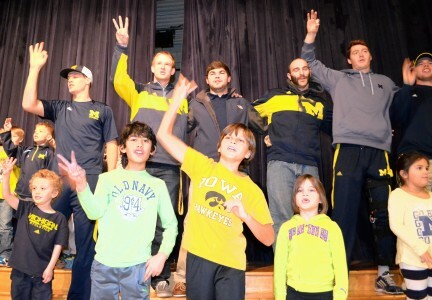 The players happily signed autographs for the students. 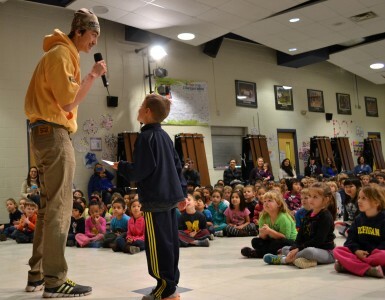 Cam Wysocki had a knack for keeping the students’ attention. The athletes seemed to have as much fun as the younger kids. One by one, players answered general questions about themselves. 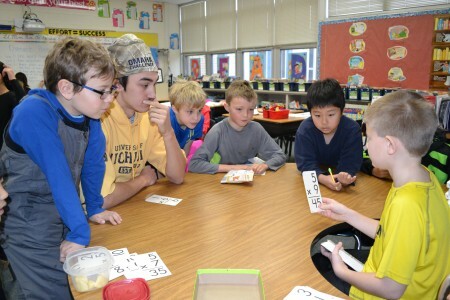 Flash cards weren’t officially on the schedule, but the competition became intense. 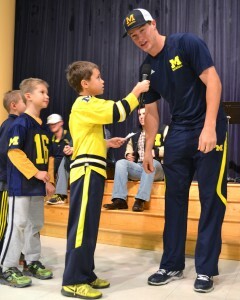 Catcher Harrison Wenson answers a question. 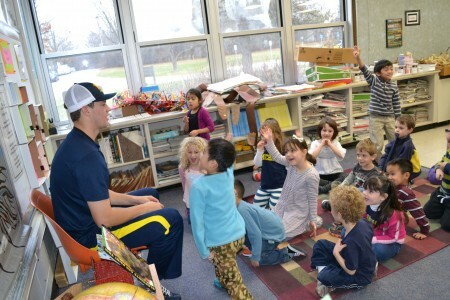 Students were chosen to direct the ball players to their classrooms for story time. 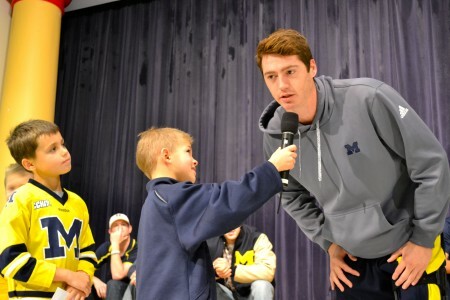 Here, Henry—a huge Michigan baseball fan—waits to show athlete Cam Wysocki the way. 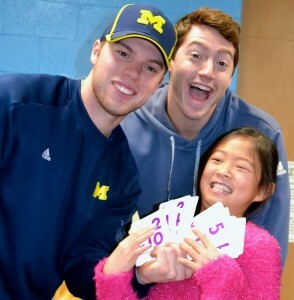 Ann Arbor native Travis Maezes and teammate Evan Hill congratulate fourth grader Rachel Wei, a math lover, for winning a round of flash cards. At 6-6, Jackson Lamb towers over the younger students.